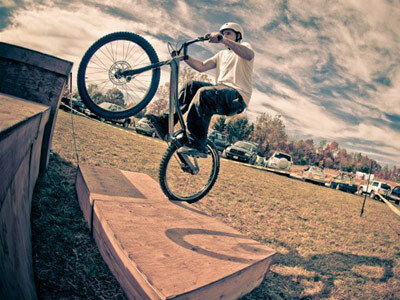 Receive more info about booking "Blind Bike Trials" for your event! Trials bike riding is defined as riding or leaping a bicycle up, onto, or over obstacles that a normal human being wouldn't consider jumping on or off of ~ without a bike. Trials riding is considered the most technically demanding of all the bike sports. What sets Matt Gilman apart from other riders of this extreme sport? In addition to having the steel nerves of trials riders, Matt takes trials to a level that is absolutely inconceivable. You see, Matt is blind. 'Matt's presentation will motivate and Inspire you to believe that anything is possible. Matt's program can be adjusted to fit your schedule but generally last about 40 minutes. Matt brings in a powerpoint for an opening video to demonstrate how he rides his bike. He also brings along the bike to bring what you see on the big screen to real life. Matt demonstrates how he learned to balance on his bike without sight. In 2004, at the age of 24, Matt lost his vision as a result of having Type I diabetes. He had been riding bikes for most of his life; when he lost his vision, he feared that he would never be able to ride again. On the advice of his doctor, Matt did not ride a bike from 2004 to 2006. One day, he decided to grab his trials bike and go out to the curb just to hop around and do some simple moves. He quickly realized that he couldn't even trackstand, and he put his bike away in disappointment. A few days later, he was determined to learn how to trackstand without vision. There was no one to tell Matt how to go about it; on his own, he needed to figure out how to handle a bike without being able to see. After several months of practice, Matt was able to reacquire this and many of the other skills he had mastered before losing his vision. Now, Matt finds that he is able to ride almost as well as he did prior to losing his vision; in fact, he rides better than many sighted riders. To truly understand what Matt has achieved, and to experience the grace with which he moves on the bicycle, and through his challenging life beyond sight, you must see it, to believe it.